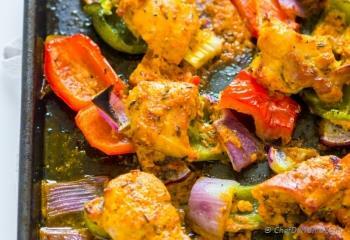 Homemade Chicken Tikka with same authentic tikka taste, and colorful veggies.. all prepared on one sheet pan! Tandoori-style chicken dinner, in matter of minutes! 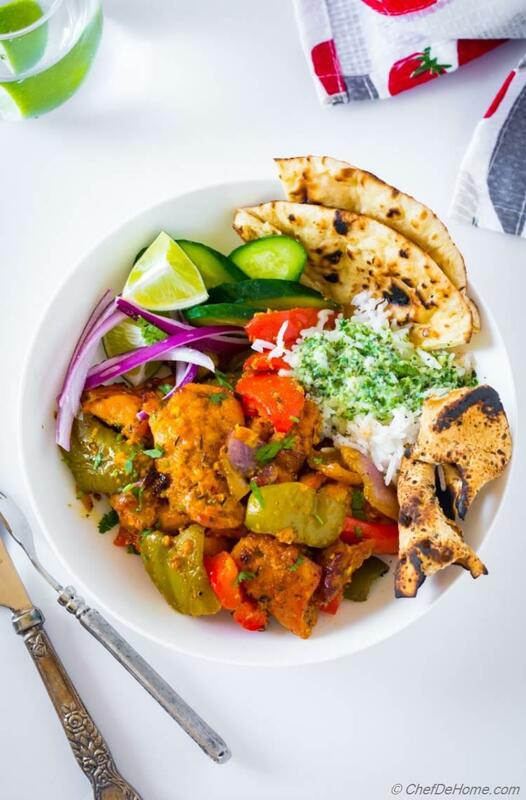 This recipe for Chicken Tikka, the epic Indian chicken main course, has been made easy and quick with sheet pan cooking! 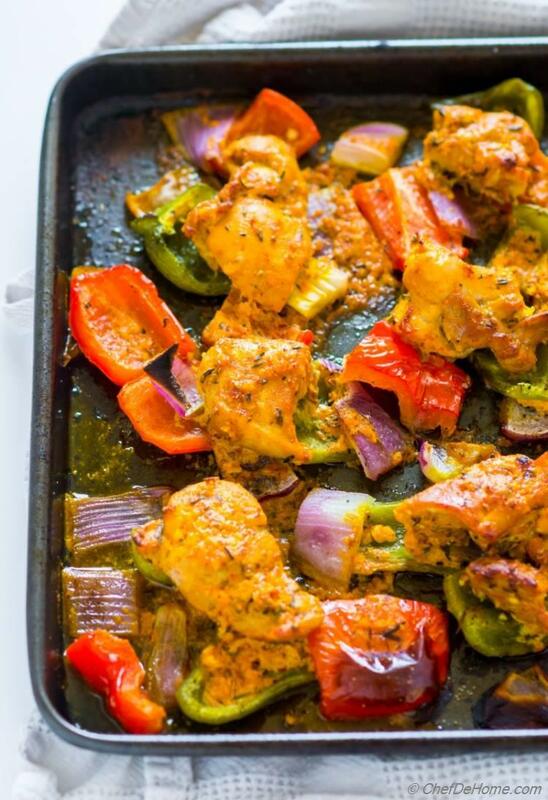 Chicken pieces coated in classic chicken tikka spices - cumin, garam masala, ginger, garlic, and baked on sheet pan topped on colorful bell peppers and onions. I call it, weekday-time-saver chicken dinner! Just like you, I'm very busy on weekdays. So, weekdays always get me thinking to simplify recipes and make dinner which will not hold me long in kitchen. 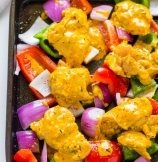 Like this sheet pan Chicken Tikka comes together in a breeze. There are only three simple steps and 10-12 minutes prep to ready a sheet full of homemade tandoori-style chicken tikka dinner! 3) Arrange everything on sheet pan. Bake! After 20-25 minutes, enjoy homemade chicken tikka! Gluten free, nut free, healthier, and still bursting with flavor. 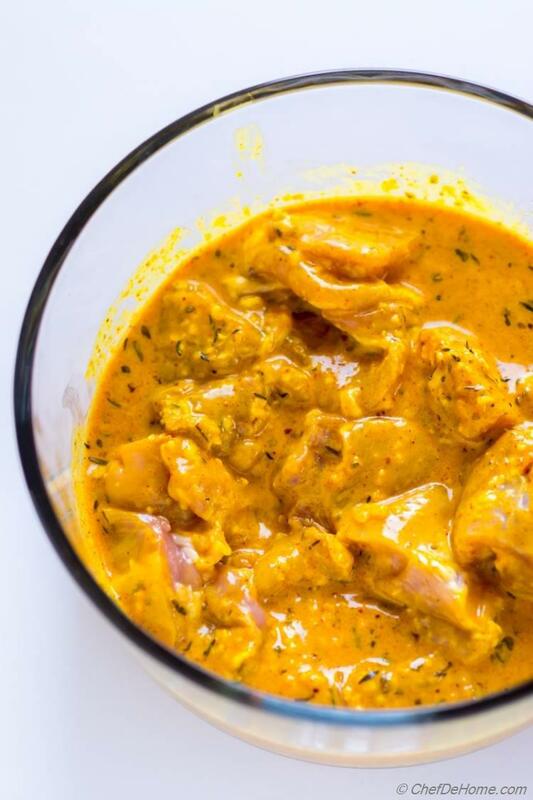 Chicken tikka marinade is combination of flavorful spices and always-at-home everyday marinade ingredients. Everyday marinade ingredients are: lime/lemon juice, oil, yogurt which naturally tenderize chicken meat. Also, keep chicken juicy while cooking. Chicken Tikka Spices - ground cumin, garam masala, chili powder, and ginger-garlic. These infuse a ton of flavor in tikka. I will be a liar if I say these are the only spices used in chicken tikka. Honestly, these few define flavor of chicken tikka. Plus I like to keep my weekday meals simple and moderate. Worth a mention, garam masala is already an Indian-master-spice, mix of lot of spices. If using a good quality garam masala, you really don't need anything else. Oh, and I like to use a little bit of Indian Ajwain to make tikka more appetizing. If you can't find Ajwain, use dried thyme leaves. Thyme gives same flavor as ajwain. 1) If I have chicken in-hand.. I cube and coat chicken in marinade, add to ziplock and freeze it. On weekdays, just taking bag out of freezer and putting in refrigerator thaws it by evening. At dinner time, just pre heat the oven, spread veggies and chicken on sheet pan.. and dinner ready in 25 minutes. It clearly reduce the prep time by 1/3. 2) If I don't have chicken in-hand... I leave marinade in refrigerator. At dinner time, I marinade the chicken while I slice onions, bell peppers, and potatoes (when using). Even 20-30 minutes of marinating makes chicken flavorful. Since marinade bakes with chicken, it seals in lots of flavor. No one can judge chicken has marinated for such short time. Note: Chicken thighs are work best for Chicken Tikka. These stay more moist and juicy. However, you can also use chicken breast. Please note that cooking time will vary depending upon the thickness and kind of chicken pieces. Make sure to check chicken is fully cooked before serving. 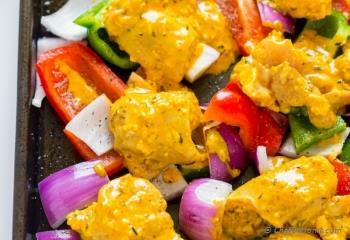 Friends, now you will never have to ask : How to make chicken tikka!? 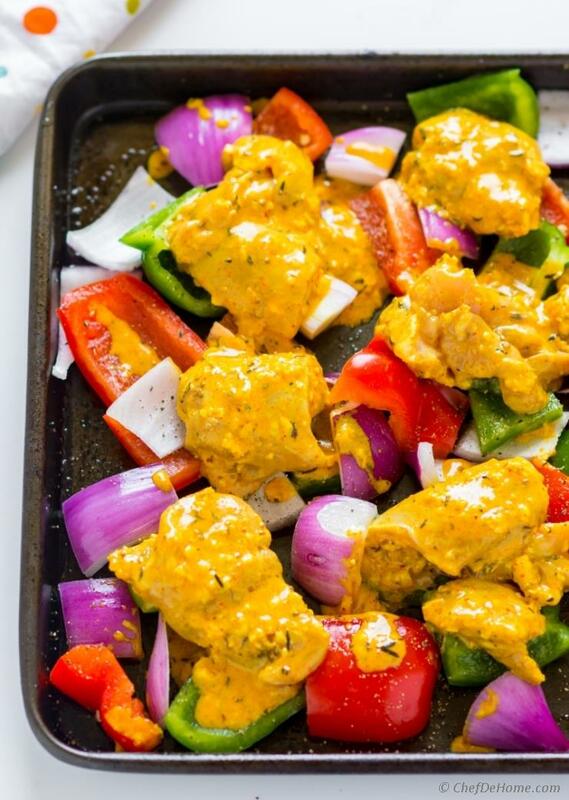 Because this chicken tikka recipe transforms from Chicken on Sheet Pan (picture above) to baked juicy Chicken Tikka with peppers (picture below) in just 20-25 minutes.. and chicken tikka dinner is ready to serve! 1) Marinade the chicken pieces. 2) Rough chop veggies - bell peppers, red onions. I used two kind of peppers for some color and vitamin boost. 3) Arrange veggies and chicken on the sheet pan. Making Chicken Tikka at home is not difficult at all. Isn't it? Oh, add more veggies such as diced potatoes, sweet potato, or cauliflower florets to make dinner more substantial and veggie-full. 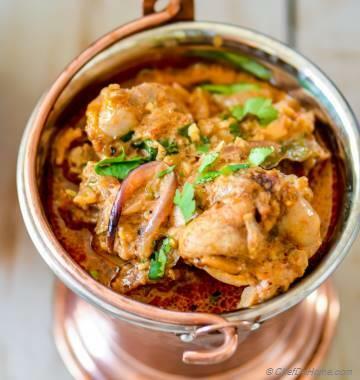 Note: If you like to serve Chicken Tikka Masala? I have few easy tikka masala recipes for the sauce. 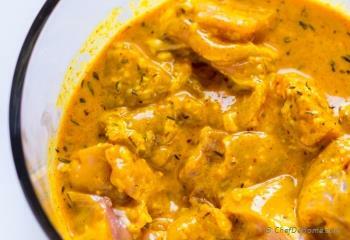 The chicken marinade can easily accommodate about 1/2 pound more chicken. So, if you planning to the stretch your chicken bake to 3 weekday meals? I suggest, add more chicken while baking chicken tikka. Then make following meals for next two days! 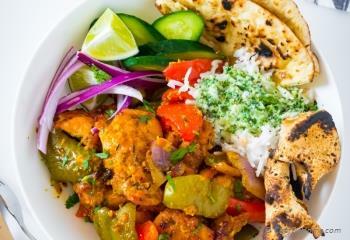 Make this chicken tikka recipe today. 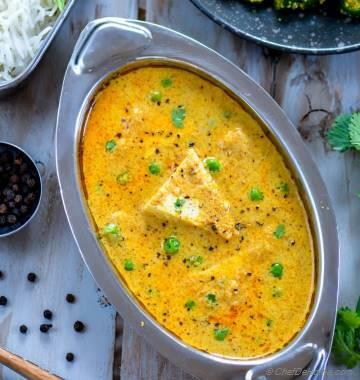 Serve with rice or naan bread. Or fill it in tacos for Tuesday Tikka Tacos! Use the chicken tikka from this recipe, add crunchy cucumber, radish, leafy greens and cooling sweet-and-sour mango dressing for a refreshing yet filling Chicken Salad for Wednesday dinner! Use the chicken from this recipe, follow the pasta recipe linked above. Enjoy Chicken and Pasta for Thursday Dinner. 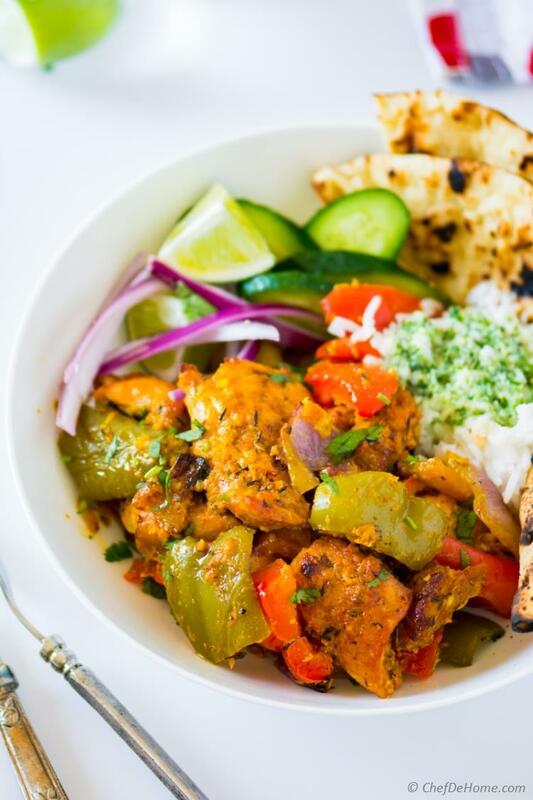 This Chicken Tikka recipe is gluten free, nut-free, prepared in very less oil, is full of veggies. 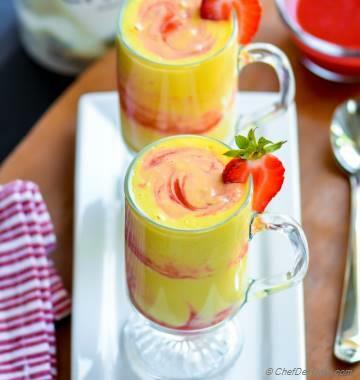 You can also make it dairy-free by skipping yogurt and adding little more lemon juice and oil. Add more veggies such as potato, sweet potato, or cauliflower for more substantial servings. 2. When ready to cook, preheat oven at 400 degrees Fahrenheit. Spread diced bell peppers and onion. Drizzle oil and season with generous two pinches of salt and generous pinch of black pepper. Place marinated chicken on top, spaced apart. 3. Bake for 20-22 minutes, then switch to broiler setting and continue cooking for 2 more minutes, or until chicken is charred at edges and fully cooked through. 4. Serve over rice or with side of naan bread. Enjoy! Make dinner more substantial by baking some potatoes or cauliflower with the chicken. Or Boil some rice while chicken cooks to serve on the side. Time of baking will vary based on size of chicken pieces. Please make sure that chicken is fully cooked before consuming!